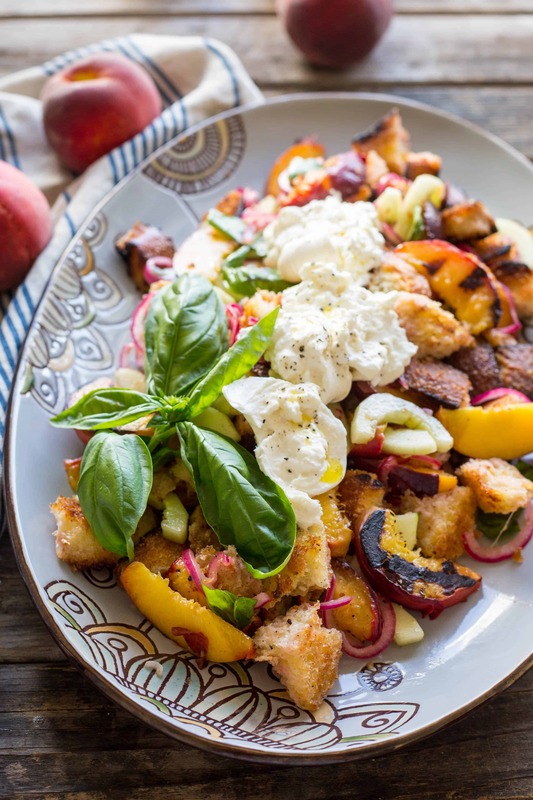 This Grilled Peach Panzanella with Burrata pairs sweet caramelized grilled peaches and a big hunk of creamy burrata for a twist on this classic Tuscan salad. The Jersey peaches this season have been absolutely ridiculous. 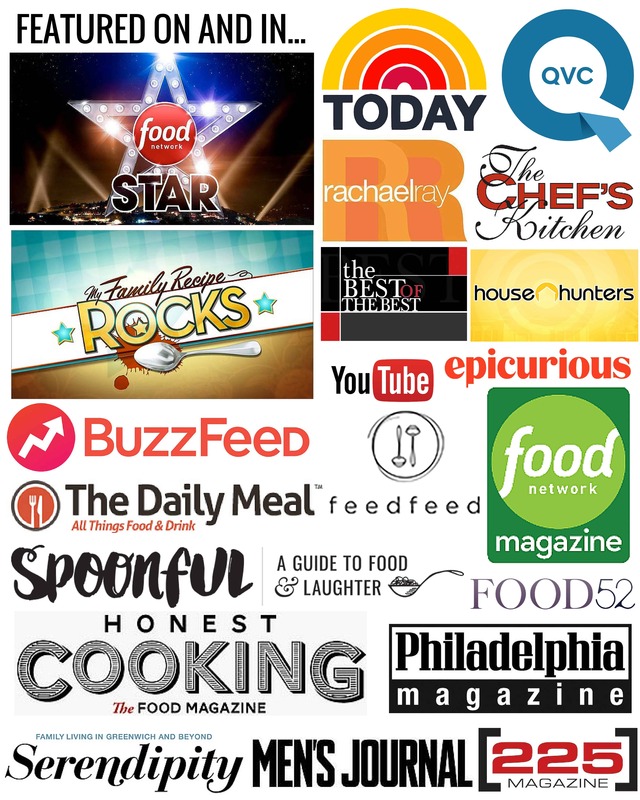 And by ridiculous, I mean good… no, actually, they’ve been great. I haven’t tasted a peach this good since I lived down South, when we used to get these insanely sweet Alabama peaches. I asked one of the farmers at the market last weekend why this year’s peaches are so much sweeter, tangier and more flavorful than usual. She didn’t quite have an answer for me. She just shrugged her shoulders and mumbled something about weather and pollination. That’s the amazing and mysterious thing about local seasonal produce that makes it so exciting – every year is different, and something new always surprises me. Several years ago I had my first taste of sun gold tomatoes and they blew my mind. Then came my obsession with fresh, locally grown garlic. After that it was husk/ground cherries. Yellow belly watermelon. Lemon verbena. Fairytale eggplant. Purple carrots! Last year I discovered canary melon, which tastes like juicy cotton candy. But this year, to my utter surprise, it’s been all about the peaches. Chaser and I have each been averaging about a-peach-a-day since early July. We’re eating them right out of our hands – sometimes on the beach, sometimes hovering over the sink, but always with juice dripping down our arms, savoring the intense burst of flavor in each bite. We’ve also been singing that peaches song that was really popular one summer in the mid-90’s to the point that it’s starting to get really annoying, and we cannot seem to stop. Go on. Just try to get it out of your head now. 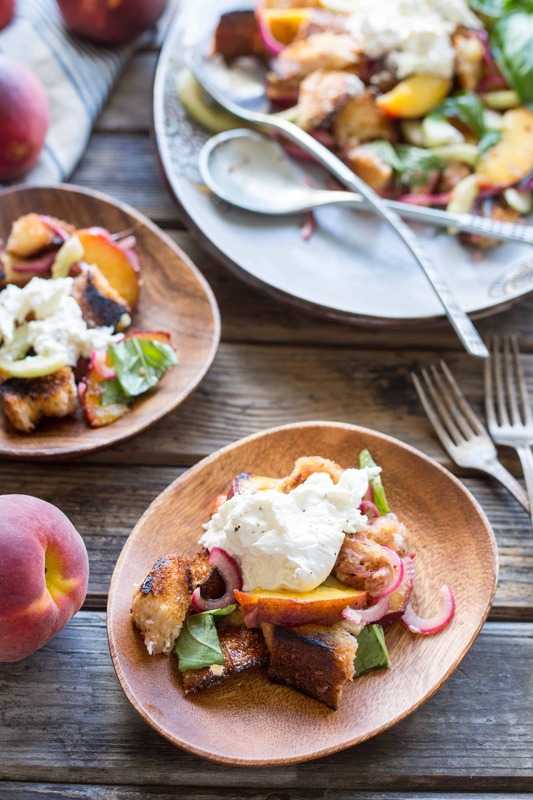 Aside from eating peaches as-is, I’ve been incorporating them into lots of different recipes. I just made this peach and blueberry crostata, and it was even better this time around because the peaches are so flavorful. I made a peach and corn salad with mint and feta, and I almost decided to blog about that, but then I made this: A rustic Italian bread salad known as panzanella, transformed into something less traditional with sweet, caramelized grilled peaches, crunchy cucumbers, loads of torn basil leaves, and a massive hunk of creamy burrata oozing down over the top. This, right here, is summertime perfection. Don’t let anyone else try to tell you otherwise. There’s not a whole lot else to say except that you should just make this. Make it, make it, make it! Do it now – don’t wait. 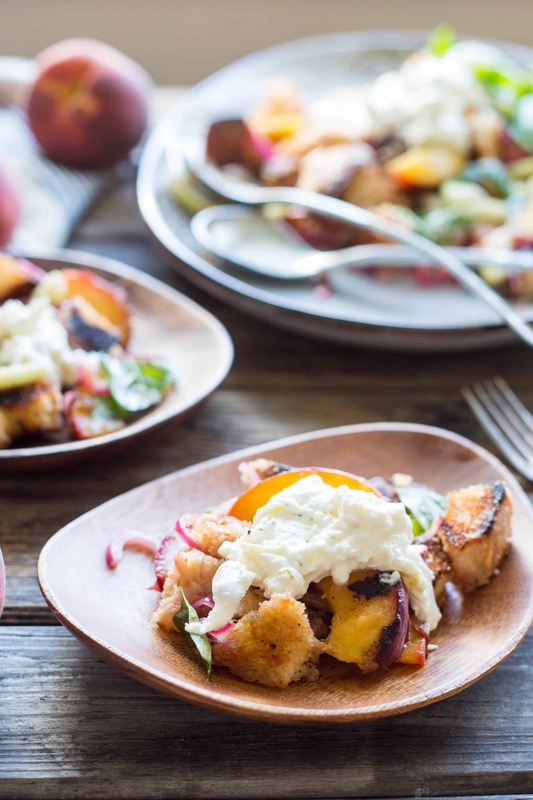 Because the peaches won’t be around for much longer, and they may never be this good again. Hopefully that’s not the case, but it’s better to be safe than sorry. Preheat a grill or grill pan on high. In a large bowl, whisk together the red wine vinegar, honey, salt and pepper. Add the red onions and mix to combine. Set aside. Toss the peaches in a medium bowl with a little bit of olive oil, salt, and pepper. Use a grill brush to make sure the grill grates are very clean, then brush them with a little bit of oil to prevent sticking. Grill the peaches, with the lid open, until nicely charred on both sides but still firm in the middle. Let cool, then cut each piece in half lengthwise or into a bit sized piece. 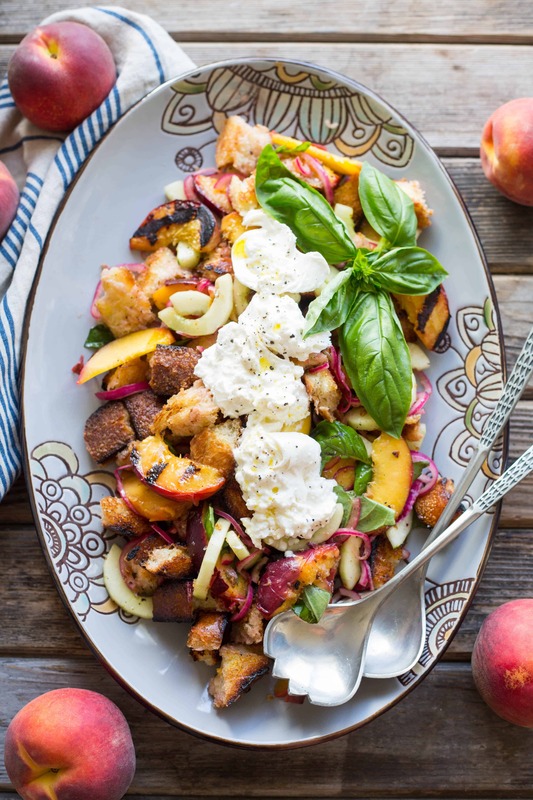 Whisk 1/4 cup olive oil into the bowl with red wine vinegar and onions, then add the peaches. Brush the bread liberally with olive oil, then grill until nice and charred. As soon as you remove it from the grill, rub the hot bread all over with the cut end of the garlic to release its oils. Slice bread into a large dice and add to the bowl along with the cucumbers. Toss everything together until the bread absorbs most of the liquid, then sit for about 15 minutes to let the flavors meld. Gently tear the basil leaves into the salad and toss to combine. Taste for seasoning and adjust as needed. 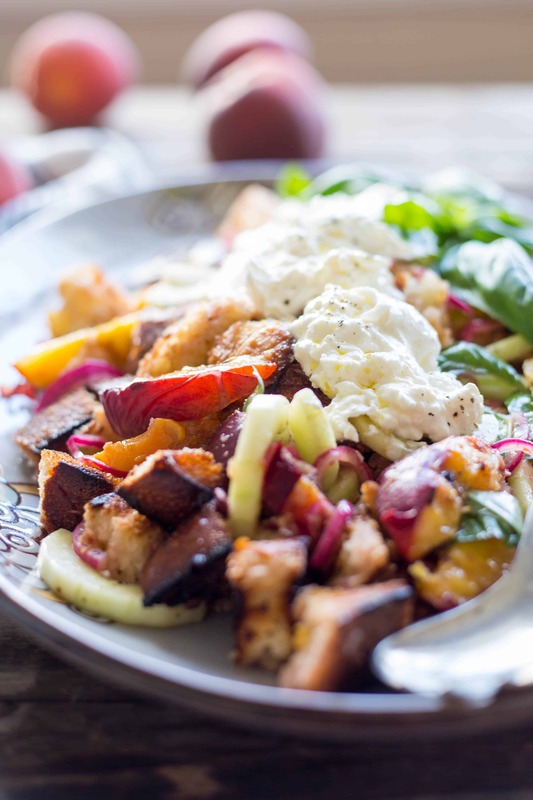 Transfer panzanella to a large platter, then break apart the burrata and scatter it across the top. Drizzle with a little more olive oil and season with a few cracks of black pepper. Garnish with more basil and serve. I love everything about this salad! 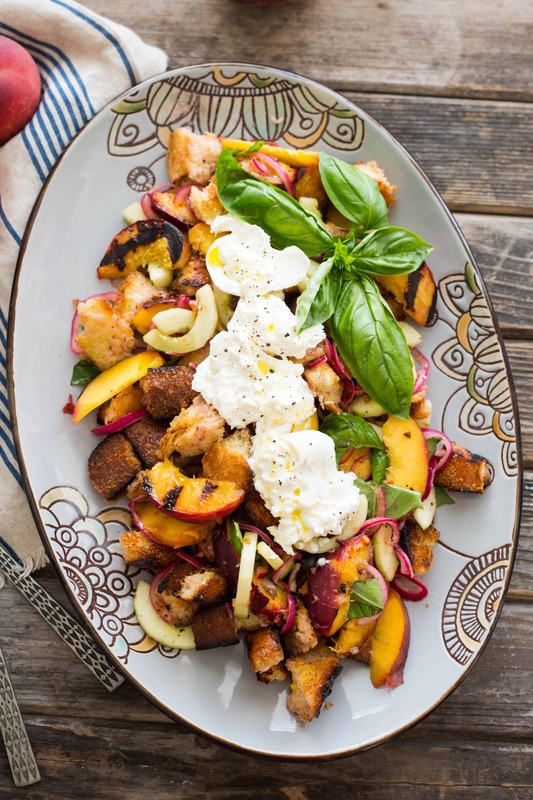 What a great take on a panzanella! thanks Sabrina!! Sooo, sooo yummy! !